If you haven’t tried tapestry crochet technique yes, you definitely should. You have probably come across lots of wonderful pictures of projects made in tapestry crochet. And they may have looked too advanced or tricky to you. Mainly because of multiple color changes and detailed images. But the truth is tapestry crochet doesn’t differ much from traditional one. It uses ordinary single crochet stitches (US term) but with yarns of several colors used at the same time. So you crochet in usual way but change yarns from time to time to create a colorful pattern. I've tried to explain tapestry process with pictures in a photo-tutorial below. And I hope it will be helpful! Disclosure: This blog post contains affiliate links marked with *. Thanks for your support! Usually there are two types of instructions available for tapestry crochet patterns: written explanations and charts. I personally find it easier to work from the charts. They are the same as for cross stitch embroidery: you can clearly see where the change of the color happens and it’s easier to count. The majority of tapestry projects are worked in round – so all the rounds are made on the right side. But you can also work in back and forth (as I did for my Tapestry Circles Pillow). Some very skillful crafters crochet all the rows on the right side, changing right and left hands. I am not so skillful, so I just crocheted my pillow cover in usual way. I got stripes on each side (as you usually do with single crochet), but I kinda like them! Copyright LillaBjornCrochet 2016. All rights reserved. This tutorial is for unlimited personal use only. Do not reproduce it. The tutorial may not be copied in any way (print or digitally), in part or in full. Please, read Copyright page for more information. If you are new to tapestry crochet, choose thick yarn and larger hook to learn this technique. The yarn should not be fluffy, as you will not be able to see each and every stitch. Don’t crochet loose. I would say you should crochet tight. You will use several yarns at the same time, and crochet with one color over another one. And if you crochet too loose, another color will be seen through the stitches. And you want to avoid it. 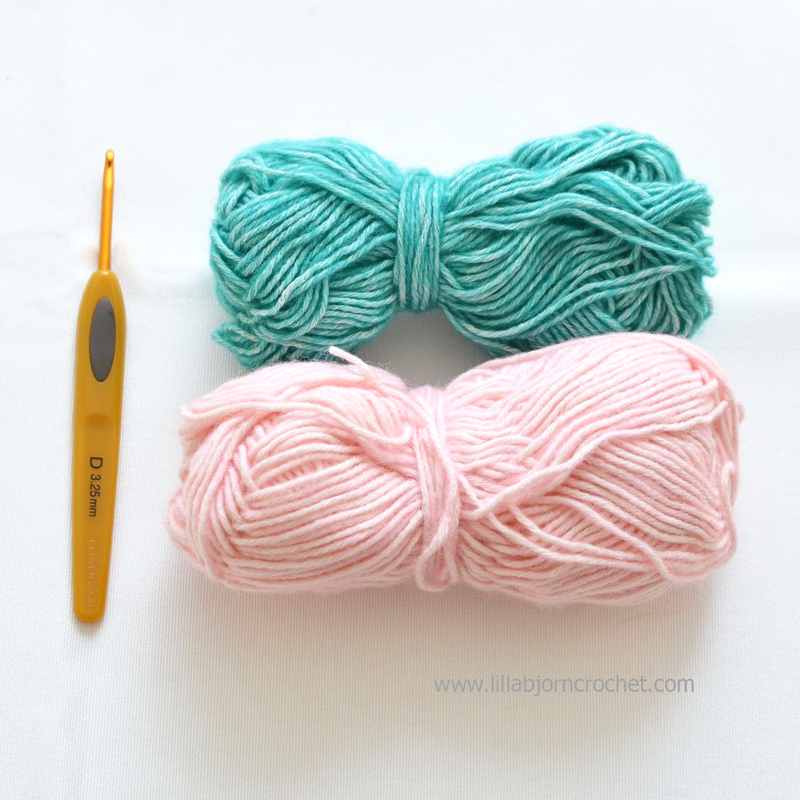 Your crochet hook should match yarn very well. If you feel like you don’t get the right tension, try to change hook to a smaller (or larger) one until you are satisfied with the look of your tapestry fabric. 1. Put yarn C2 on the top of previous row. Now you will continue crocheting with yarn C1 in the usual way - but at the same time over C2. 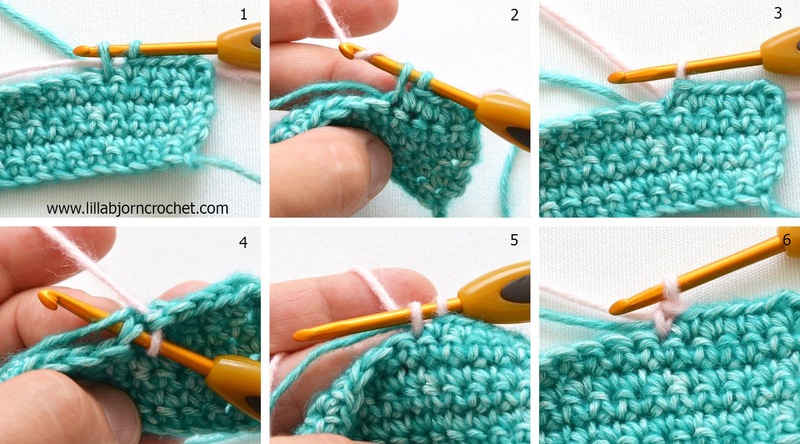 Hold C2 with your left hand (if you are right-handed) together with crocheted piece, so that it’s easier for you to insert the hook. 2. The color is always changed when you still have 2 loops on the hook. So you will do it on the last yarn over (to finish last stitch in previous color). Now, after color is changed, place yarn C1 on the top of crocheted piece and continue to crochet with C2 over it. 3. If you do everything correctly, the yarn of different color will not be seen either on right or wrong side. 4. If you see the yarn through the stitches, try to pull the (inside) yarn a bit before every color change. But don’t pull too much, as your work may wrap! 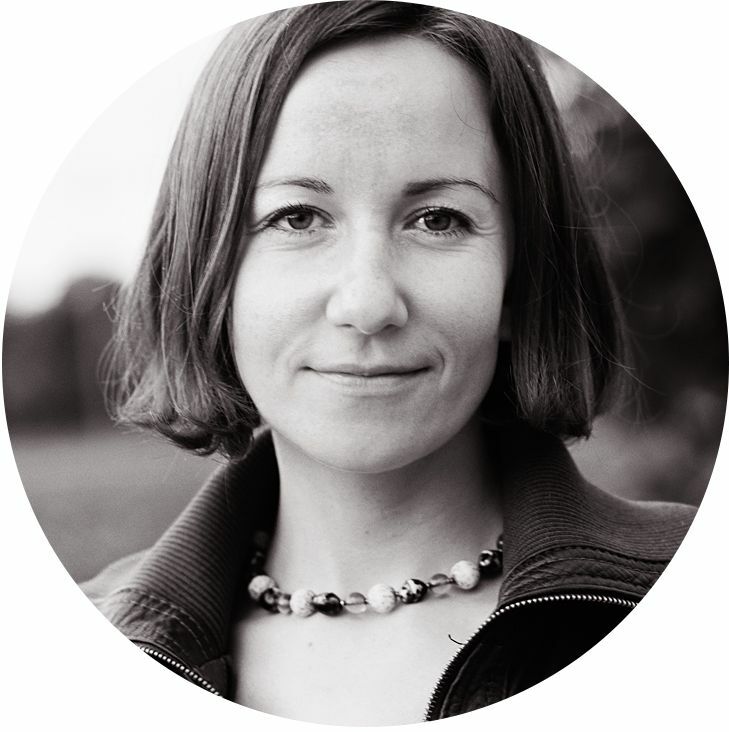 The width of your project should stay the same after every row. 5. 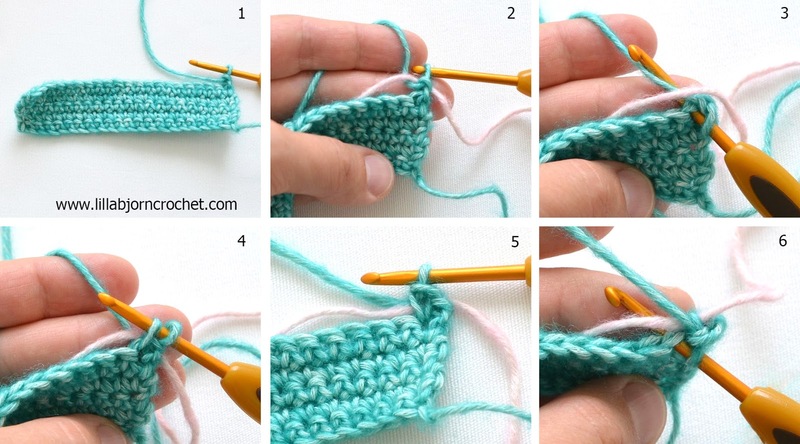 You should crochet over yarn of different color while making EVERY stitch. Don’t miss any. Otherwise you will get floats of yarn on the right (or wrong side). 6. When you work in rows it is important that you decide on which side is right and which is wrong. It has nothing to do with the pattern, as it will be reversible. But it is important to know how you should begin each row. When starting row on the wrong side, you should hold second yarn in front of your work. And starting row on the right side - hold 2nd yarn behind the work. It will give small colorful waves on the wrong side, while right side will look nice and neat. For this tutorial I used Stoned Washed* yarn by Scheepjes in shades 815 (C1) and 820 (C2). And 3.25mm Clover Soft Touch* crochet hook. The definition of the stitches with this yarn is very neat. And I would say it is great for tapestry crochet. The only disadvantage is that it is a bit difficult to frog. So you may want to use other yarn (scraps) to practice. But I would definitely recommend Stone Washed for your finished projects in tapestry crochet. I used it for my newest Tapestry Circles Pillow design. You can see the pictures HERE. And HERE is my review about Stoned Washed yarn. This small sample uses 2 colors of yarn. As you see first 4 rows are made in one color (C1 - aqua), and then the triangle pattern with C2 (pink) begins. Ch1 in the beginning of each row doesn’t count as sc, so make 1st sc of each row in 1st st of previous row. Row 1. Ch22 with yarn C1 (aqua). Beginning in 2nd ch from hook, sc in every ch till the end. (21sc) Turn. Row 2-4. Ch1 (doesn’t count as sc here and throughout), 21sc. Turn. Row 5. On this row and next rows till 11th you will use C2 (pink) together with C1. 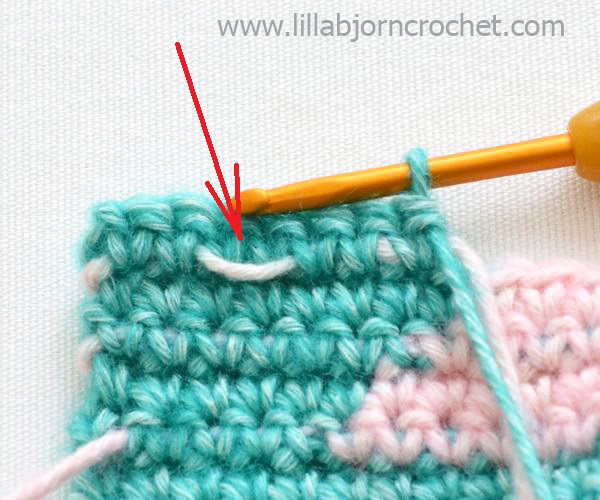 Place C1 along the top of your crocheted piece and start crocheting over it, as shown above. Ch1, 5sc with C1 (change color on 5th sc), 11sc with C2 (change color on 11th sc), 5sc with C1. Turn. Row 6. Ch1, 6sc with C1, 9sc with C2, 6sc with C1. Turn. Row 7. Ch1, 7sc with C1, 7sc with C2, 7sc with C1. Turn. Row 8. Ch1, 8sc with C1, 5sc with C2, 8sc with C1. Turn. Row 9. Ch1, 9sc with C1, 3sc with C2, 9sc with C1. Turn. Row 10. Ch1, 10sc with C1, 1sc with C2, 10sc with C1. Turn. 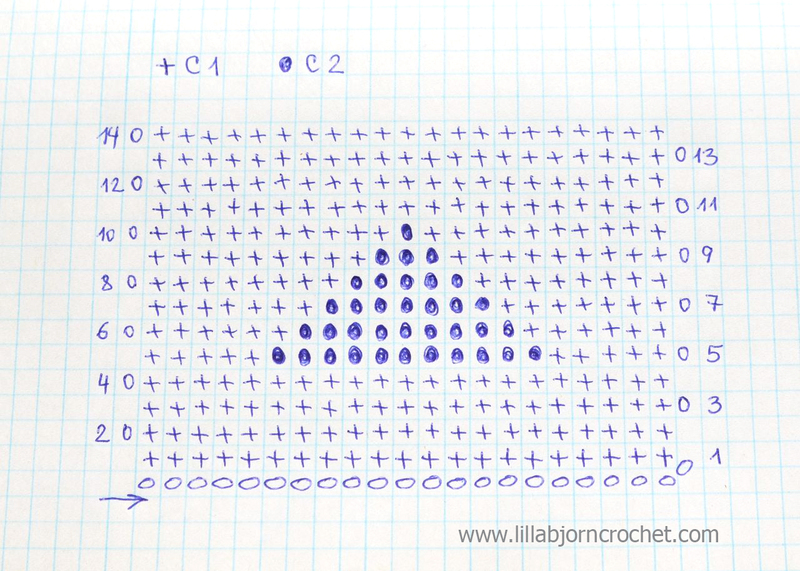 Now you can either cut C2 and work next rows with C1 only, or you can continue crocheting over all the stitches with C1 (over C2). 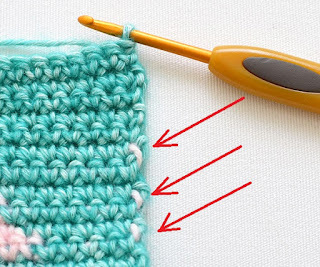 In this way your crocheted fabric will have the same thickness. In my sample I cut C2, because Stone Washed yarn seems thick enough to me, and the difference in thickness between the parts is not critical at all. Row 11-14. Ch1, 21sc with C1. Turn. Congratulations!!! Your first sample in tapestry crochet is finished! Did it work well for you? Please, share your opinions with me! If you would like to learn more about Tapestry Crochet and try some free and paid patterns – be sure to check art work of Carol Ventura and her web-site HERE. 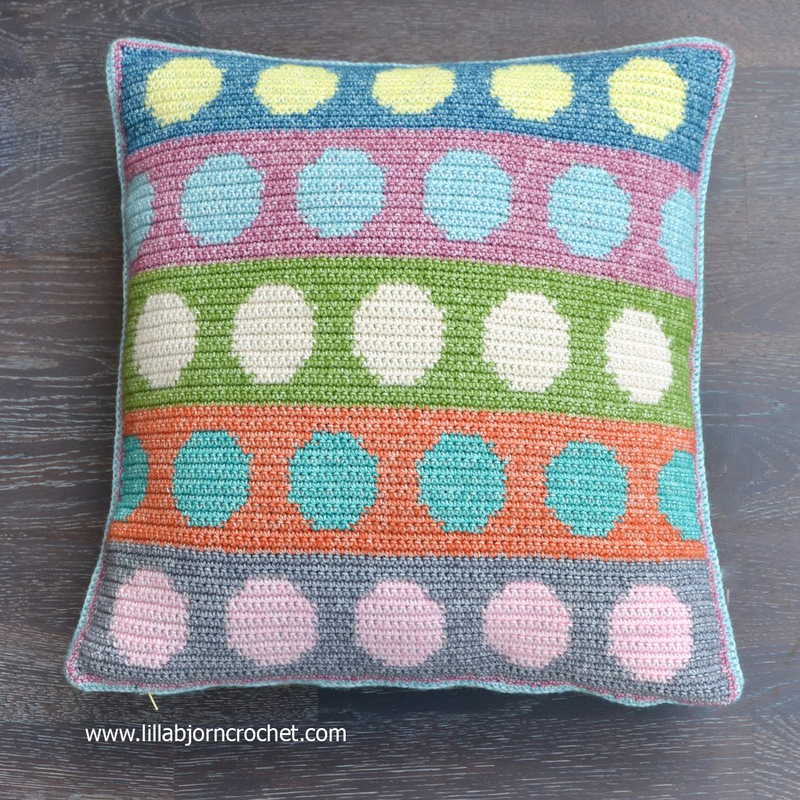 And FREE pattern of my Tapestry Circles pillow will be very soon available here on my blog. UPDATE: the pattern is HERE. Thanks for the tutorial. I can't wait to try this! Your tutorial is very very helpful. Love your beautiful works either. Thank you so much! Thank you for this. I haven't yet, but I want to try tapestry crochet. Do you have, or can you recommend a tutorial for tapestry in the round? Hi! 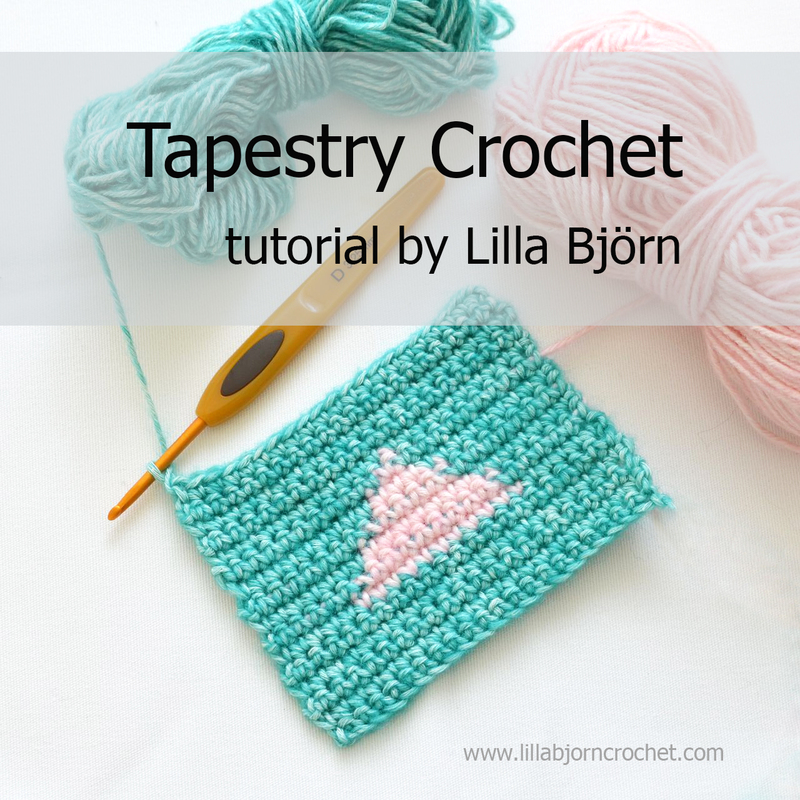 I don't have a video like this, but there are tons of video tutorials about how to do tapestry crochet in rounds. You should crochet in continious spiral without joining rounds.